It is Christmas today. One of my favourite festival. 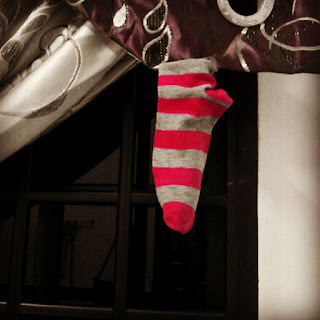 When I was a small girl, I used to hang socks on the window waiting for Santa Claus to come and give me presents. And I also used to sit by the window, look at the sky hoping for snow on christmas. But when grow up only I realise it will never happen. So I just cherished those moments. After ages, yesterday someone told me to hang red socks on the window. Santa Claus sure will come this year and give you present. Have faith he said. Even though it is ridiculous, I still hanged a red sock with a hope. Morning came but Santa Claus did not come. I even had a dream last night that that someone bought gift for me and presented to me for christmas. But in the morning nothing happened.